We visited the garden of La Petite Rochelle at Rémalard for the first time in late summer 2010 (see Gardens of Normandy – La Petite Rochelle) and immediately fell in love with it. Even after the hot and arid summer it was a delight, so we were keen to make sure we saw it early this year to see what it would look like in spring. We were not disappointed. Whereas last August the summer flowers like phlox, agapanthus and roses had been the stars, this time we were able to appreciate the magnificent wisterias which scramble at every turn over arches, across pergolas and up into the tops of trees, the big, blowsy tree paeonies (paeonia suffruticosa) in their rainbow colours, and scores of azaleas and rhododendrons that had been hidden in the background on our previous visit. If you are in south-east Normandy this summer we highly recommend a visit to the garden at La Petite Rochelle, which lacks the fame and kudos of Giverny but has ten times more charm and interest for amateur gardeners; it is not enormous but is choc-a-bloc with features to inspire – ponds, fountains, statues, arches and places to pause and appreciate the beauty. A couple of unusual pounts of interest are a fountain and statue to Saint Fiacre, patron saint of gardeners, and a memorial grotto in memory of Peter Wolkonsky, creator of the Jardin de Kerdalo and cousin of the owner of La Petite Rochelle, Helène d’Andlau. La Petite Rochelle is open one weekend per month in April, May and June. It is then open every day during the main French holiday period mid July to mid August BUT afternoons only, 13h00 to 19h00. Entry for adults is 5€ in 2011. If you’re looking for accommodation in reasonable distance, the route shown is from our B&B on the border of Normandy and Pays de la Loire. 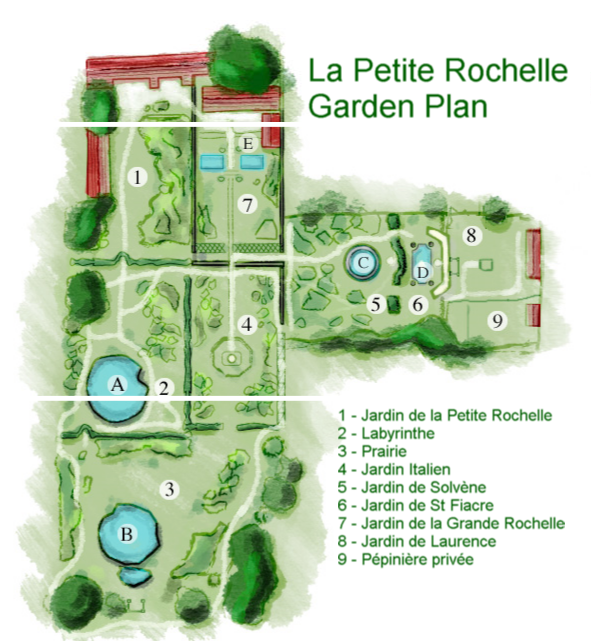 We are about 45 minutes away from Rémalard and Petite Rochelle garden by car. Nearby are several other Perche gardens of note such as the Jardin François and the Gardens of Château de Lorière.